So the Mad Hatter – Johnny Depp, answers to an incredulous Alice…And since nothing is impossible in Wonderland, as well as – sometimes – even in our real world, here is that stylists and designers, inspired by Lewis Carroll fairytale resurfaced with the latest Tim Burton’s movie, are enchanted by speaking rabbits, cats that appear and disappear, caterpillars that smoke hookah. 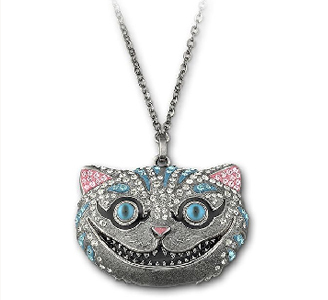 Check it out the latest Swarovski creations… Pendants, earrings and rings with the teacups of Hatter, White Rabbit’s watch, the hearts of the Queen …Fantastic the Pendant with the Cat, created with coloured crystals. You can buy it online. Do you always want to be the Queen of all hearts? 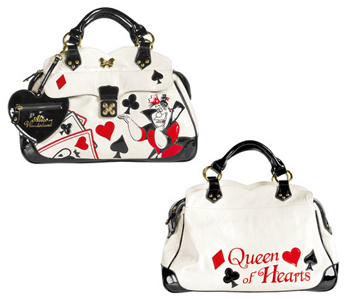 Don’t miss the Queen of Hearts bag, proposed by Atelier FixDesign, a brand that has always loved mixing reality and fantasy. Coloured leather embossed with applications seeds of playing cards and Queen. Have fun discovering the Alice-inspired collection including t-shirts and dresses.